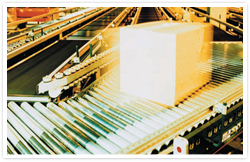 Temperature controlled shipping facility in American Canyon, CA and St Louis, Mo paired with their advanced quality control, Online shipping. Solution, direct communication resources, exceptional inventory control and outstanding customer service provides the “right solution” for wine shipping..
Club Line that can handle up the 1,000 packages in a single run. Personalized carrier labels and packing slips. Customized emails to your consumers. Direct to Consumer shipping in environmentally friendly wine trays that are made from 100% compostable materials. We also carry lay down foam trays for presentation in mind so that tasting notes, newsletters and flyers don’t bend while in transit. 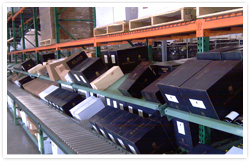 Flexible and Fast -- Assurance of prompt fulfillment for your wine club and release shipments. Precise -- All packing slips can be personalized with winery name, address and phone number – carrier labels include winery name, address and phone number. This process ensures customer confidence and reduced returns. Fulfillment/Compliance -- Complete national distribution offering bi-coastal fulfillment. Direct to consumer and Wholesale compliance offered. E-mail notification -- E-mail notification send to your customer with tracking information.